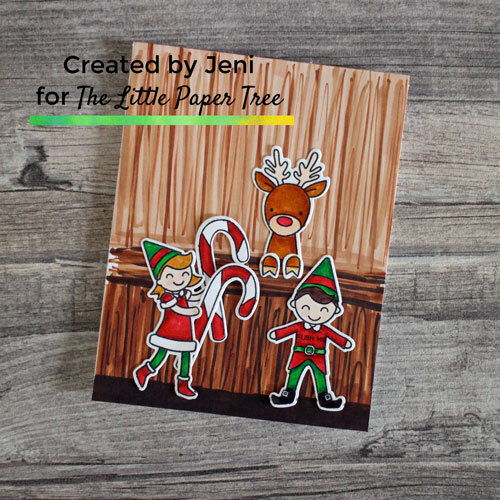 Hi, it’s Jeni with an amazing card! This is the first time I’ve played with the Chibitronics and they are so much fun! I wanted to make the reindeers nose light up so I used the cute reindeer from Polar Peek A Boo Pals and the two elves from a Heffy Doodle set. I used the Chibitronics Starter Kit for this card, but we have extra LED light kits (in white and colour) and copper tape in stock. All the products I used are listed and linked to the shop below. I will try to make sure that this tutorial makes sense – I plan on doing a video tutorial using a different circuit. I started by stamping all my images in Midnight ink. The reindeer and his hooves from Polar Peek A Boo Pals by Avery Elle and both elves and the candy canes from Elfish Antics by Heffy Doodle. I coloured them with my Zig markers and die cut them out. I will list the colours I used in product list at the bottom of this post. The background is one piece of Neenah Solar White card trimmed to 4 x 5.25″. I placed the elves and reindeer on the card to figure out the placement and (moving the reindeer out of the way) poked a hole behind his nose. I made a pencil mark where the front gate of the stable would be then moved all the coloured images to the side. I used Copic markers for my background. I only have a couple of the E colours. I am still learning how to use Copic markers (after owning a good selection of markers for 10 years). I drew across the top of the front gate to separate the front gate from the back wall of the stable and drew messy diagonal lines to add the colours working up to my dark brown. I used my darkest brown to add the lines for the planks of wood. I did the same for the back of the stall in lighter shades. Realistically this should be darker but I didn’t have any darker markers – and its just a card it’s not meant to be realistic. For the floor that the elves are standing on I used my darkest brown marker. I poked a pencil through the hole to mark the placement for the LED light on another piece of card and used a pencil to draw the circuit in a rectangle style. I marked the negative side and positive side of my track then adhered the copper tape down. I bent the tape to make “hospital corners” and left a gap for the LED light. I also needed a holder for the battery. I used a small piece of copier paper to make a flap, and glued one side to the card. The copper tape needs to go over the flaps so they will touch the battery. I used a red LED light and made sure which was the negative side and which was the positive side, and adhered this down. The LED lights are self adhesive. I placed the battery in the holder to check that everything was correct and my red light lit up! I firmly pushed all the copper tape and the connectors on the light to make sure my circuit was secure. I used tape adhesive to adhere the reindeer to the front of the scene – making sure the light would be in the nose area. I also stamped “PUSH ME” on the boy elves tummy. I adhered the hooves, and the elves to the front panel and added the candy canes in the girl elves hands. I needed to add some foam tape around the holder to keep the copper tape on the flap from touching the battery continuously. If I didn’t then the light would always be on and the battery would die. I added two layers of foam tape around the battery holder and the rest of the card. You can add foam tape over the copper tape – it won’t break the circuit. I removed the foam tape from the centre of the card and only half removed the backing paper from the foam tape around the edges and lightly placed my front panel to the circuit. I checked and double checked that everything was working right and fully pushed this down and removed the rest of the backing from the foam tape. I was so excited about taking some photographs of this card that I forgot to add it to a card base. Maybe with a red mat? Let me know what you think?